In any event, you sauté some thinly sliced onion in olive oil and, when it is soft, add crumbled sausage meat and allow it to gently simmer for a few minutes over gentle heat. (The meat should not caramelize.) Season well and add frozen peas and crushed tomatoes (or chopped fresh tomato if you have it) and allow that to simmer until it has well reduced and the tomato has separated from the oil. Boil the chiocciole in well salted water until al dente, then add to the sauce. Mix well, over low heat then add a healthy dollop of fresh ricotta and just a bit of grated pecorino. Mix again and serve, topped with additional pecorino for those who like it. You would normally add a ladleful of the hot pasta water to a sauce mixed with ricotta cheese to loosen it a bit and smooth it out. But the pasta shape here–chiocciole, or little snails, are one of the those pastas (like shells) that tend to carry water in their insides, so simply don’t drain them too well and you should have enough liquid to form a nice, smooth sauce. Of course, you don’t have to use chiocciole. 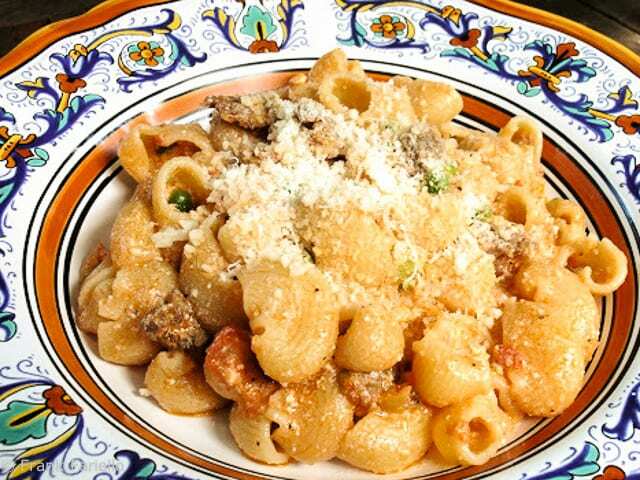 Other forms of stubby pasta will do–the molisani themselves use rigatoni. But I think that some kind of concave shaped pasta would be best, as they tend to ‘catch’ the bits and pieces of sausage and peas within their cavities. I fell in love with your blog the moment I stumbled on it, and have been cooking from it since. In fact, we’ve been on an Italian-food binge these last few week using your recipes as inspiration. No regrets, not a single one!! Thank you Frank and Angelina!!!! i looked at the picture and IMMEDIATELY wanted it for dinner tonight!! I went out to the store and bought the ingredients, and then finished reading the post!!! GREAT DISH!! you have a fantastic blog here!! Great! You're welcome back any time…!